Bayern Munich are to set up a 'training camp' for refugees coming into Germany and will donate 1m euros (£730,000) for refugee projects. Parts of Europe have seen an influx of migrants arriving, with many in Hungary wishing to travel to Germany. The Bundesliga champions plan to provide food, German lessons and football equipment for children. "Bayern sees it as its social responsibility to help the refugees," said club CEO Karl-Heinz Rummenigge. The number of migrants entering Europe has reached record levels this year, largely driven by the conflict in Syria. Germany expects to take in 800,000 asylum seekers this year - four times last year's total. Bayern, who have won the German league title 25 times and are five-time European champions, will also highlight the current refugee crisis in their next home match against Augsburg. The game on 12 September will see the starting line-up enter the Allianz Arena "holding the hand of a German child and a refugee's child". Bayern's rivals and current league leaders Borussia Dortmund invited 220 refugees to watch the side play Norwegian side Odd in the Europa League last Thursday. 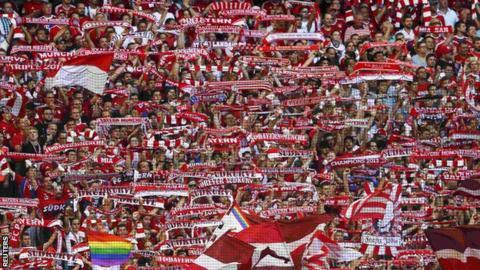 Rivals Mainz gave out 200 free tickets to their home match against Hannover last weekend. Banners carrying positive messages in support of refugees were evident at last weekend's Bundesliga matches. Meanwhile, Celtic announced their share of the proceeds from this weekend's Jock Stein 30th anniversary events will be devoted to assisting those people affected by the current refugee crisis. Football expert Raphael Honigstein talking to BBC World Service: "The Germany refugee crisis situation plays out in city centres across the country. You either hear of them being helped by nice people or faced with demonstrators and right-wing terrorists trying to burn down places they are staying in or beating them up. "You have to take your hat off to fans' groups who have seen this and decided they need to show whose side they are on. You have clubs all over Germany who organise games with refugees, even before this latest wave of refugees. It's a real grassroots movement." Journalist Ronald Reng talking to BBC World Service: "It shows you that the ultra fans want to be seen as political groups. There is certainly a change. They don't want to be just football fans, but be something more. "When football fans have been seen as political groups they have usually been associated with being right wing, particularly in Italy. In Germany they want to distance themselves from the first movement - the hooligan movement."